Kids love 4 things from the Kmart Easter Catalogue this week. The first one is the Lindt and many more brands chocolate gift boxes. Exclusive offers like Lindt Easter egg & bunny, large egg bag, mini's gift pack, and more are available on pg 12. To me, the coolest gifts are the confectionery gift boxes of M&M's, Maltesers and more popular brands on pg 13. Buy Cadbury favorites for only $9.50! Another thing to love is the bunny toys. Friends to the company and protect the kids while they sleep or rest. Kids' bunny onesie costume is only $10 at Kmart. You can also find novelty stationery items like Easter activity books on this catalogue. Kmart sells these for $5 each. Find Easter on everything in the catalogue. This week's deals on pyjama sets, novelty fleece onesie, slipper boots are available on pg 16-19. Kids' sleepwear and indoor clothing are interesting offers and Kmart's prices are making this shopping easier. 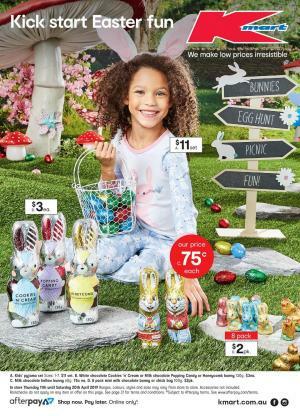 A variety of Easter bunnings is available on the first page of the Kmart Easter Catalogue. In this catalogue, you'll be able to browse many items from the sleepwear category, too. Ribbed pyjama set is only $11 and it has Easter bunny print. You might want to redecorate your home with tall Easter bunnies. Kmart offers lower prices for products like Cadbury dairy milk bunny. Cadbury is a leading brand in Easter treats and bunnies of the brand are available on pg 3. See pg 4-5 of the Kmart Catalogue for decorative items. Metallic design of Easter bunnies, eggs, wooden Happy Easter sign and more traditional elements are on sale. Buy Easter egg wreath for only $12 at Kmart stores this week. Happy Easter fabric treat bag, Easter fluffy chick, and more Cadbury Easter treats are on pg 6&7. Buy Easter chocolate character hunt bag for only $8! Extraordinary items are also available in the range of Easter at Kmart. 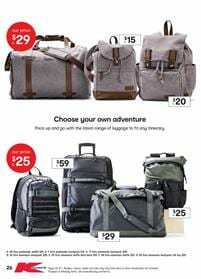 You can find the whole product range in the content of Kmart Catalogue. Find more Kmart Easter eggs, and toy-chocolate products like Kinder Surprise. Kinder's 6 pack characters will cost only $4. Kmart Catalogue has Lindt and Cadbury Easter products on pg 12-13. All the pages are browsable right now. Follow our Facebook page to get these on your feed. Get emails via subscription which is completely free. Having colourful options for stationery products always motivate students to study harder. Scented products of Scentos are markers, highlighters, mini pens, pencils, gel pens, and more. Buy Scentos scented stationery 24 pack for only $8! You can find more Easter toys of the Scentos and Paint Your Own People set on pg 16 of the latest Kmart Catalogue. Kids will enjoy great stories. Check out the book range of Kmart on pg 17. Here We Are Book is gonna cost only $15 and more are available there. Popular games have their toys all the time. If you like games and Marvel characters, visit pg 18 to see its toys. Fortnite Battle Royale collection pack is only $15 at Kmart. Also, exclusive toys are available this week. Easter toys are Metal Machines Croc Attack Set, T-Rex Attack Set, and more on pg 19. Have a collection of great cars from great movies. Pay only $1 for the Metal machines single vehicles.